How Soon Should Your Child See the Orthodontist? If you’re the parent of a young child, you’ve probably noticed lots of mouths filled with braces at events you attend with your pre-teen children. You also might be wondering why some children are wearing braces that young. The reason is because today advances in orthodontics and dentistry have taught us that in many cases it’s best to apply orthodontic treatment in two phases. The first phase occurs as a child’s permanent teeth begin to erupt. The second phase occurs later, once the last primary tooth has been lost. The big question is when to start? Dentists and orthodontists are in general agreement with the American Association of Orthodontists. 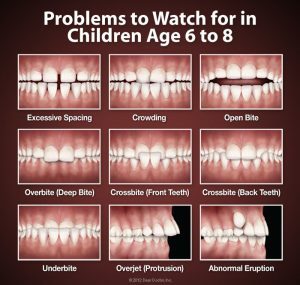 The AAO states that once children reach the age of seven, they should at least visit an orthodontist for an initial consultation. At this consultation the orthodontist will determine whether braces might be necessary. This age range is important because research demonstrates identifying and correcting problems are more effective after the arrival of a child’s first four permanent molars and first four central incisors. The eruption of these teeth usually occurs around age seven. Once this milestone has been reached, the goal of the initial consultation is to determine whether or not your child could benefit from a two-phase approach to braces or whether they’ll need braces at all. A lot tends to happen in a first consultation, so you and your child should expect to spend at least a half hour in the office that day. The idea is to be as thorough as possible. Your orthodontist will be asking a lot of questions of both you and your child. The assitants will take digital X-rays and photographic images of your child at this visit. Additionally, a financial coordinator will discuss finances with you. X-rays provide a structural view of your child’s head, mouth and jaw. Photographs serve as good tools to guide the aesthetic side of orthodontics. After all, those changes on the inside of one’s mouth affect the outside of the face as well. What are the benefits of early treatment if two-phase orthodontics is recommended? One major advantage of two-phase orthodontic treatment is addressing jaw development concerns. Children are growing a lot at this point in their lives. Early treatment is implemented to literally “guide” the development of a child’s jaw so it grows into proper alignment. Doing so early can prevent issues down the line that may even require surgery to correct. Overcrowding contributes to crooked teeth, therefore proactively managing a child’s teeth can allow for necessary extractions in the teen years. It is very possible to avoid extractions later in life if a an orthodontist monitors a child from a young age and gives recommendations for extractions as necessary. By addressing dental issues that may result in teasing among peers, two-phase treatment can eliminate social difficulties that might disrupt a child’s self-esteem early in life. Many people outside of the professional circuit see orthodontics as an aesthetic life-event. Therefore, it makes sense to address particularly thorny concerns early rather than later. Again, it’s important to remember that two-phase orthodontic treatment isn’t something every child requires. However, the American Association of Orthodontists does have your child’s best interest in mind in suggesting a consultation at the age of seven. Adams and Cheek Dentistry works with a number of orthodontists in the area. Please contact us at http://raleighncdentistry.com/contact-our-office/ to find a reliable one near you!